I feel like I’ve owned this movie on DVD forever. It’s one of those I got on sale at some point and never watched. Being Steven Spielberg’s early directorial effort (albeit as a TV movie) was a reason to buy it, but I never found a reason to pop it in. For the record, this is the extended 90 minute version released theatrically in Europe, as opposed to the 74 minute television version made for American audiences. I watched DUEL (1971) on 11.30.13. It was my first viewing of the film. For the most part, this is a one man show. 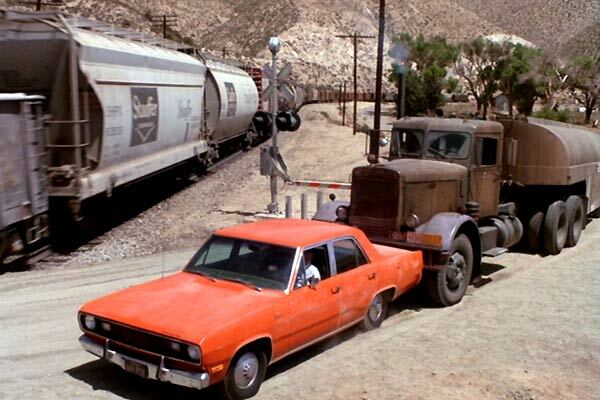 David Mann (Dennis Weaver) is commuting to work down a mostly quiet Los Angeles area freeway. He passes a slow moving (and heavily polluting) truck. The driver of the truck gets mad and passes Mann. This goes back and forth for awhile until the trucker begins to become malicious, nearly causing a major accident. Mann pulls over to calm down and put some distance between himself and the truck. Only, as an audience might suspect, this doesn’t happen. The trucker waits, manipulates, attacks. To say the ‘trucker’ does this is to be literal. In fact we only ever see the boots or the silhouette of the driver. Truly this becomes a matter of man versus machine (or, more to the point, Mann versus truck). The truck is dirty, gritty, and powerfully relentless. It seems to have a face almost, with the headlights and grill being shown almost to the point of becoming fetish. Themes regarding the depersonalization of transportation in the 70s certainly still hold weight, though this is really an exercise in building and maintaining suspense. It might have been early in Spielberg’s career, but he clearly understands how to manipulate a shot to create tension. He holds a long time on moments, waiting for the payoff to show up in the rear view mirror or over Mann’s shoulder. A climactic climb up a hill is painfully slow, and unrealistically dragged out. No car would endure what Mann’s car does, yet this does not matter. As an audience, we know the car can’t possibly make it, yet it does. We want it to, we want him to survive. There is no sense that Mann would successfully engage the driver, because this is about the truck. If he got out of the car, the truck (not the driver) would kill him. He must make it up the hill. The movie is clearly stretched to 90 minutes to create a full run time. A couple of stops on the way drag more than they need to. This is a movie at its best when Mann is behind the wheel, fighting for his life. While this does not maintain pure excitement for 90 minutes, it does succeed in creating a series of 5-10 minutes of intense suspense, punctuated by long pauses to the action. This is a movie which, if you can forgive some seemingly pointless pauses, holds up pretty well 42 years later. ~ by johnlink00 on December 2, 2013. Great review! I LOVE this film and you made so many great points about the build up of suspense and how Spielberg handles the film best when Mann is struggling to survive. Ole Stevie was just starting to cut his teeth with his craft and Duel is a great experience in watching how well a pretty mundane story can actually have purpose and weight when directed with skill. Nice job! Thanks! It really is interesting to see that Spielberg had that sort of vision right out of the gate. It’s too bad it had to get re-edited after he was done with it! Have had the chance to look a the similarities between this film and Jaws. Spielberg had fascination with the faceless killer and you can still feel this movie in his modern work. It’s really a defining film. Though simple and dry you can see seeds take place.